At the Monaco Anime Game International Conferences this past weekend, game designer Yu Suzuki unveiled a batch of work-in-progress screenshots of Shenmue 3. 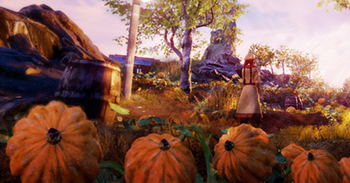 The new images feature rural environments, including a misty stream, a farmhouse and a pumpkin patch. Shenmue 3 was announced at Sony's 2015 E3 Press Conference as in development by Suzuki's independent studio YS Net, pending the success of a Kickstarter funding drive. Though the game tripled its funding target, collecting $6 million (making it the record holder for the most crowdfunded videogame project on Kickstarter), YS Net launched a second, "slacker backer" campaign last September, hoping to raise that number to $11 million and accomplish all of the developer's goals. To date, the slacker backer campaign has brought in less than $250,000 in additional contributions. Shenmue 3 is planned for release in 2017 on PlayStation 4 and Windows PC.